Commandos are the country’s best hope for staving off advances from the Taliban and ISIS. The 2016 fighting season is still heating up as insecurity begins to mount in Afghanistan. Major population centers such as Lashkar Gah and Kunduz are under siege by Taliban forces while the Islamic State (ISIS) is struggling to build and maintain a foothold in Nangarhar province. The daily news cycle in Afghanistan rarely has good news. But not all is lost; as usual each fighting season some good news emerges out of the peril and chaos. For the 2016 fighting season that story is the Afghan commando, Afghanistan’s first, last, and best line of defense. Afghanistan has been embroiled in a bitter and bloody fighting season, with soaring civilian casualties as both sides of the conflict jockey for the potential upside in any future negotiations. The main prize and bargaining chip is Helmand Valley, the storied birth place of the Taliban and the former reclusive leader Mullah Omar. Helmand hosts the Taliban’s major financing operation through the distribution and smuggling of opium, and historically has seen some of the bloodiest and most violent battles of the conflict in Afghanistan. Daily news roll-ups continue to forecast the impending collapse of the province; however, the province continues to stay under the control of Kabul, hanging on by a thread, largely as a result of Afghanistan’s commando force. Deploying out of bases in Kandahar, Helmand, and Kabul, Afghanistan’s commando force is flexible, light, and capable of conducting nighttime raids and dispatching rapidly to areas under threat. The quick and flexible response of this unit has allowed the Afghan army to stay on the offensive, disrupting Taliban operations, and providing rapid reinforcements to areas under threat. Commando forces have been pivotal in protecting major provincial capitals such as Kunduz and Lashkar Gah, where these highly trained and motivated forces have managed to push back Taliban sieges in Nawa district and Kunduz. In July, in reaction to an ISIS suicide attack in Kabul that killed 80 and wounded 200, Afghan commandos spearheaded an operation in Nangarhar province with the assistance of U.S. and Afghan air support; the commandos killed over 100 militants and seized a main center of ISIS operations in Kot district. 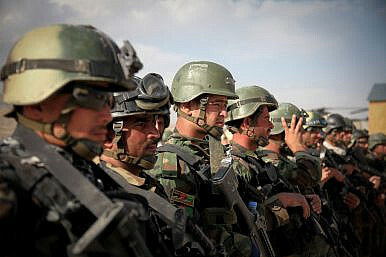 Afghanistan’s commando force is the most heavily relied upon unit in the country. Trained at Camp Morehead in Kabul, the unit is comprised of roughly 11,500 soldiers in comparison to the country’s regular army and police force of roughly 320,000. The School of Excellence at the commando camp trains its specialized fighters in conducting raids, airstrikes, and targeting operations. Afghan commandos are traditionally trained to conduct 72 hour operations; however, as of late operations have been going for upwards of 20 days, putting strain and fatigue on the highly prized unit. Commando fatalities have spiked this fighting season despite the unit’s pivotal role in regaining strategic ground and conducting offensive disruption operations against Taliban forces (such as the recent night raid in Baghlan). Due to high defection rates in traditional police and army units, Afghan commandos have been forced to bear the brunt of much of the conflict. “We can’t do anything without them,” said Abdul Qahar Aram, spokesman for the Afghan army’s 209th Corps in northern Afghanistan. The heavy reliance on Afghan commando units is controversial. With only 9,800 American and NATO advisers in the country, much of the attention and mentoring for Afghan forces is provided to commando forces. Despite double fatality rates compared to 2014, Afghan commandos still retain a 90 percent retention rate, highlighting their reliability and motivation to tackle some of the country’s most ferocious battles. The commandos have been pivotal in 2016, spearheading operations in Nangarhar, Kunduz, and Helmand, and providing rapid smashing operations that allow conventional forces to flood and mop up the battlefield; Afghan commandos will continue to be the prized unit of Afghanistan. Much of Kabul’s future will rely on how well it manages, trains, equips, and rests this vital force. At current operation tempo, the unit could burn itself out, yet with only 11,500 troops they are the best line of defense against an estimated 35,000 Taliban and several thousand ISIS fighters. Red Group: The Taliban's New Commando ForcePay Attention to Russia's South Asia StrategySectarian War Is Looming Over AfghanistanWinning the Elusive Peace Against Terrorism in AfghanistanWhat’s Behind the Taliban’s Major Gains in Northern Afghanistan?